Based in New York and Seattle, the Tiptons (formerly Billy Tipton Memorial Sax Quartet) perform original compositions and arrangements of world music on saxes, clarinet, voices and drums/percussion. 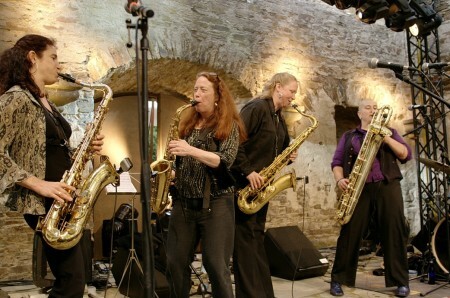 With concerts that cover musical territory from New Orleans “second-line” to free jazz, Afro-Cuban to Balkan, Klezmer and beyond, the Tiptons create some of the wildest sounds ever to come out of a sax quartet. Their dynamic, playful concerts feature high-energy interaction between members, and a repertoire using sax, voice and drums that touches on soulful music from around the world. This tour features the dynamic Seattle drummer and long-time friend John Ewing from the Reptet. The band’s newest CD, Strange Flower, includes 12 songs penned by each of the players, inspired by the lonely echo of train whistles at night, scientific findings on bees from Harper’s Magazine, and covering genres from micro-Big Band to Gospel, Bluegrass to Balkan, Whimsical Jazz to Nocturnal Funk. All these diverse styles are unified by the Tiptons’ solid instrumental and vocal talent, forged from 20 years of collaboration.